Now this corn is just plain amazing! The moment I bit into this yummy corn I knew Zo had really out done herself and put my main coarse to shame! The only comment I made when she was mixing her butter was, "OH babe, add a pinch of Cumin!" She gave me the look of YUCK! So I followed with a, "Trust me on this one" She did and I am happy to report she was happy she did! Zo and I agree that there is just something about a pinch of cumin with citrus and butter that is just amazing and this is coming from a two cumin haters. I hope you enjoy this corn as much as I and my parents did! 1 tbsp 2 tsp volcanic lemon juice. Combine ingredients and mix well in a small bowl. Peel tough outer husks away from corn leaving only the softer inner husks intact. Peel the inner husks back gently without removing and pull away any hair. Rinse corn and dry. Spread rub over corn evenly over and replace inner husks, gently pressing down on the rub. 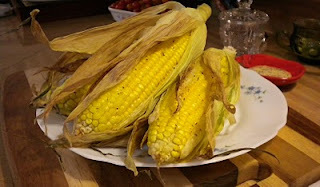 Place all corn on a baking sheet and bake for 25-30 minutes or until corn is tender and juicy. Remove from oven and let set 3-4 minutes before serving hot! Enjoy!